Hardwood lumber is truly a global commodity. With today's high speed networks of communication, the best Appalachian hardwoods are just a click away from any point on the globe. Mayfield Lumber is making the effort needed to provide solutions to all of our customer’s needs. The more yield you get from our lumber, the more profit you will see. In this day and time, the cost of labor, insurance, utilities, freight, and energy always challenge the profit line. Buying lumber that is consistant in quality, fair on grade and tally, and delivered as ordered is one way to free up more time to battle the other challenges that all of us face every business day. Our industry is always changing and we all must develop plans that will keep us “in the game”. Taking the lumber through the full process of air drying, kiln drying and stress relieving produces higher quality lumber with tremendously greater yields. 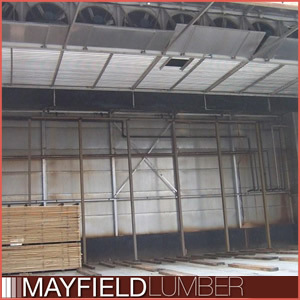 Mayfield Lumber uses only fluted stacking sticks and lumber dividers. This allows air to flow under the stick and prevents stain. Maintaining flatness during the drying cycle will always be good for the customer. 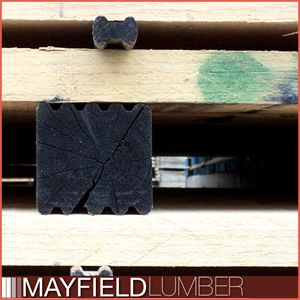 Mayfield started the process of fluting all stacking sticks and cross-outs in 1999. By 2001, all sticks were fluted as well as the cross-outs. We have seen a dramatic reduction of any sticker shadow. We also started converting all of our foundations to concrete in order to protect the flatness of our lumber. The bottom layers are as nice as the other layers. Note that all sticks and squares are in direct lines of placement helping to protect the quality of the finished product. It's all about yield! If you need your order surfaced, just request and tell us your desired thickness. Our modern stacker can stack 150,000bd/ft of lumber per 8 hour shift. This ensures that the lumber is placed on stickers quickly to avoid any stain. Lumber cannot be rushed! Each species has a personality and years of experience have taught us that time and gentle methods achieve the best results. Mayfield intends to dry 24,000,000 bd/ft (56,600 m3) of fine hardwoods each year.